Newsletter No.013 The missing link, what happened to the courtesy car? Welcome to the new look newsletter. As mentioned in the e-mail, the newsletter very quickly outgrew the old system and changes had to be made. We had several problems. In order to pack the newsletter full of great info, we had to attach quite a few files. Many newsletter list members found this a problem with down load time or with individual restrictions on mail size. Our solution is to make it web browser based. You will receive an e-mail every fortnight with the URL for the latest newsletter. You will also be able to go back and look at old newsletters. We hope that this feature will make our newsletter system an excellent resource tool for our customers. The old newsletters can be found here. I hope to have them all published before this newsletter comes out. Any questions? Or you want to get off the list? E-mail me here. Couldn't have put it better myself. Wondering what "Bundt Pan " wheels are? That's what the yanks call the classic 14" alloy from the 70's. 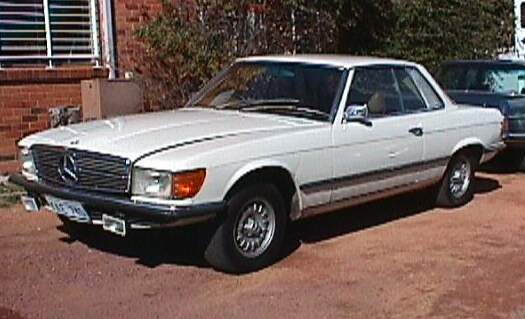 Many Mercedes-Benz fans in the 70's were disappointed when Mercedes-Benz didn't bring out a cabriolet version of the W114 coupe to replace the W111 cabriolet. Since Mr Daimler and Mr Benz merged back in the 1920's there had always been a hansome four seat convertable car in the model line up. 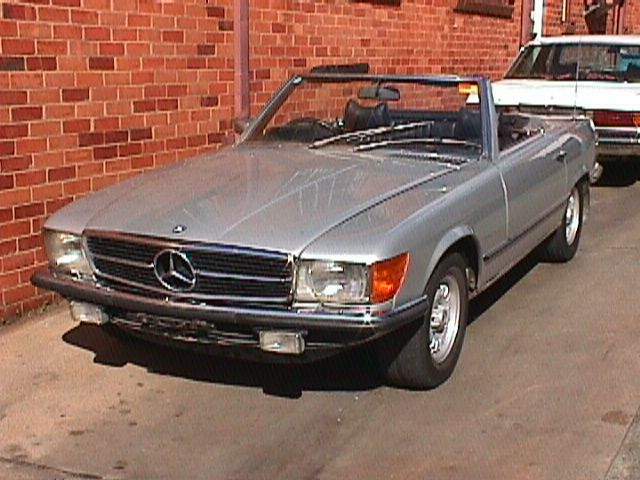 This trend finished in 1971 with the 280SE 3.5 Cabriolet. The model that replaced it was the 350SL, a two seat car designed with a totally differant purpose in mind. It was not until nearly the end of the 1990's when the CLK cabriolet was released that a four seat convertable was once again included in the model line up. But, a clever German company is now trying to right the wrongs of the Stuttgart design teams that decreed that cabriolets were not marketable. 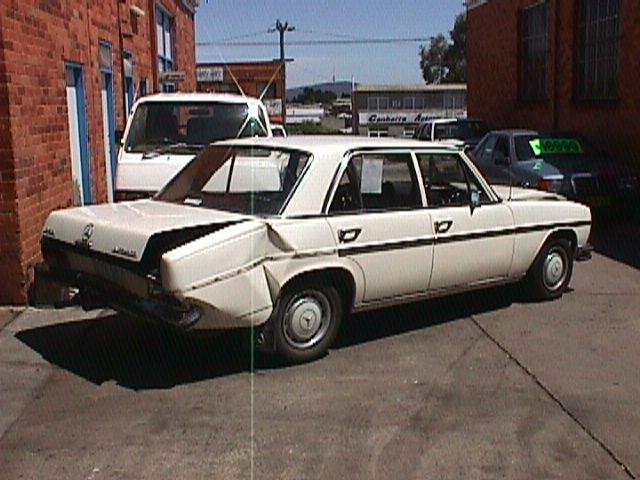 Have a look here at the Baehr Companies conversion kits for the W114 and W123 coupe. The dark blue w123 coupe really takes my fancy and could live in my garage any day. An interesting point to note is that the 280SE 3.5 cabriolet version of the W111 is now the most sort after version of this model. 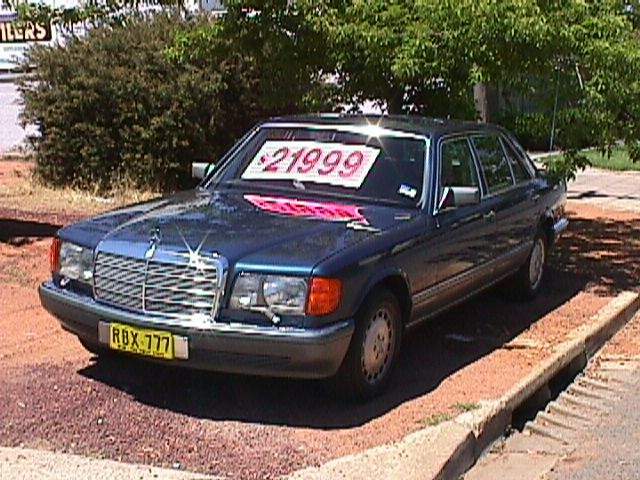 Some examples have sold for over $150000.00 Australian Dollars. 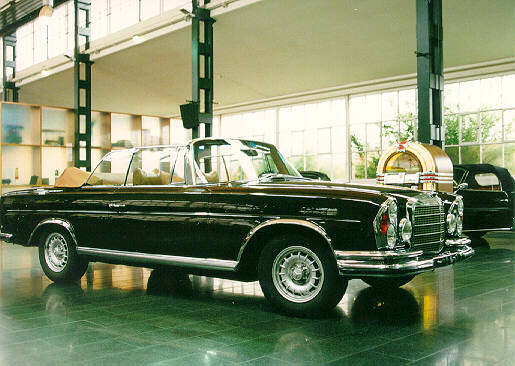 Here is a picture of one in the Mercedes-Benz Classic Center in Fallbach (Germany). Here is one of the benefits of the updated newsletter system. Full pictures of all cars for sale. 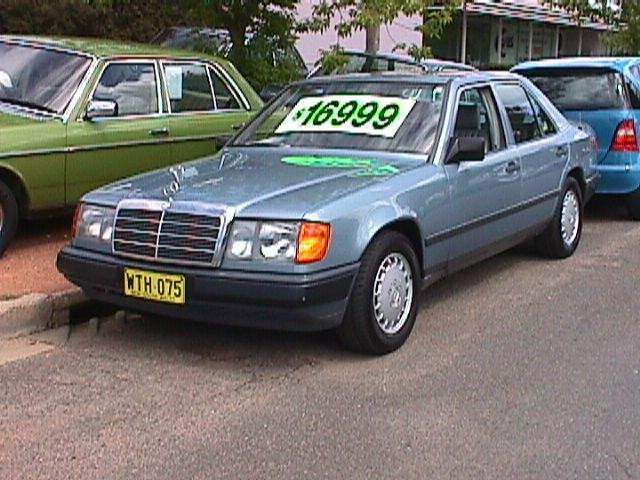 We have just brought a super neat 1986 300SEL sedan with full MB dealer history. 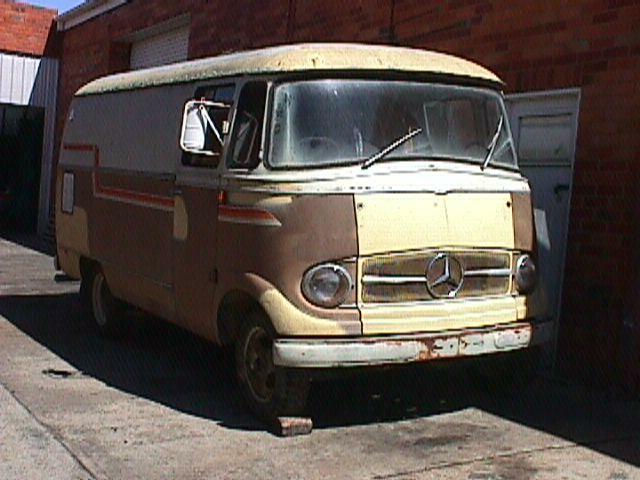 Also, my father has for sale in Melbourne an ex wedding hire 220S 1958 Ponton sedan. The 280E and 280SE sedans have been sold since the last newsletter. Excellent condition. Ex Wedding Hire car. Faultless black 2-pac duco with red leather. All chrome and lenses perfect. Strong engine and quite drive train, perfectly functioning Hydrak system. $12990.00AUDMore details. Look at the picture below. It is what remains of our courtesy car. It was a 1971 250 W114 sedan. Last Friday it was the meat in the sandwich in a four car pile up. Lucky for the customer and his family who were in the back seat all got out without injury. If you have a good look you can see how the "passenger safety cell" works. The rear mudguard is designed to deform like it has with no damage to further forward than the windscreen. The rear door gaps are still the same as when the car left the production line back in 1971and the door still open and shut perfectly. One of the other cars in the accident was a late model Nissan pulsar sedan. Both the front seats had broken and were laid right back (it was hit from behind). 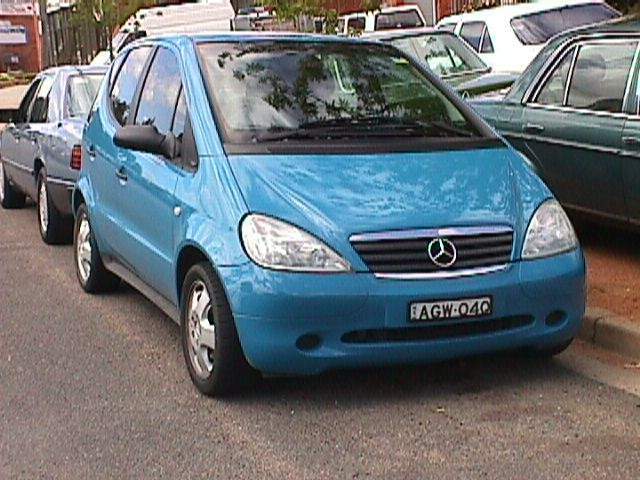 I wonder if the Nissan owner had the time to look at the condition of the Mercedes and compare it with his car. Both were written off, but I know which one I would have rather been in. So thats it for the first of our new look newsletters. Hope you liked what you saw. If you have any ideas or want to contribute any articals, pictures or other material please e-mail me here.